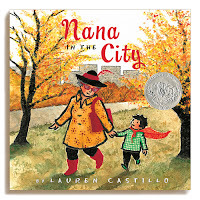 I considered writing about Nana in the City by Lauren Castillo as part of the Environmental Book Club feature, because Nana lives in a specific environment. But "the city" is not what you'd call a natural environment, at least in the way we think of natural environment. I think it could be argued that cities grow up or evolve in some natural way over time. But not too many people are going to accept that the concrete, metal girders, and glass of the city are natural. So I'll discuss the charming Nana in the City here. Okay, so this kid's nana lives in the city. The child clearly doesn't, because he finds everything about the city scary. If you know any anxious or high strung preschoolers (or maybe preschoolers, period), this rings very, very true. The book does a very quick, simple job of turning the child narrator's attitude around. The very things about the city that he is uncomfortable about, his nana likes. She's able to make them sound desirable. 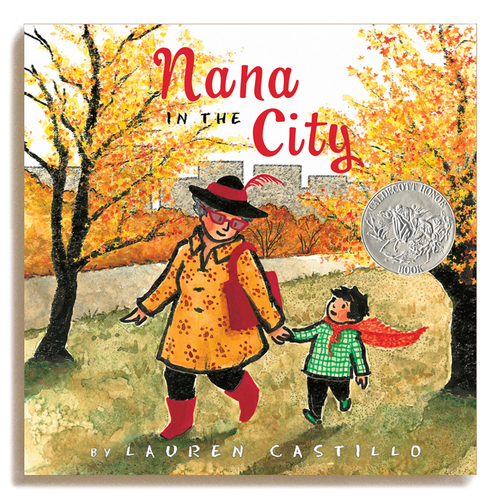 Lauren Castillo, who is both author and illustrator, does a great job of using image to carry part of the story. No doubt the committee that awarded her a Caldecott Honor thought so, too.